As soon as my wife and I got engaged, and before any actual wedding planning got underway, we knew that we wanted our honeymoon to be at Walt Disney World. Our first time there together, about a year earlier, was a four-parks-in-four-days blitz. Incredible, and an insane amount of fun, but exhausting. 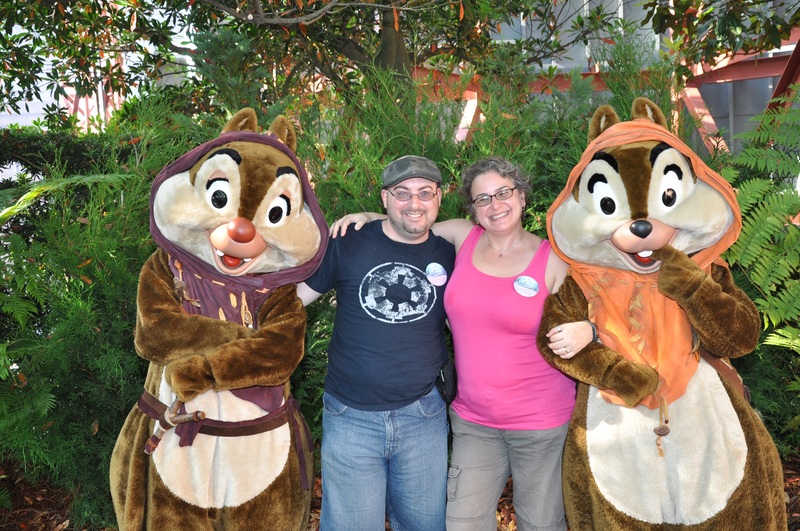 For the honeymoon we planned a trip that had some days at the parks—Hollywood Studios (for Star Wars Weekends) and Magic Kingdom—but we also wanted a trip that was a bit more relaxing, and we wanted to experience more of what Walt Disney World has to offer. 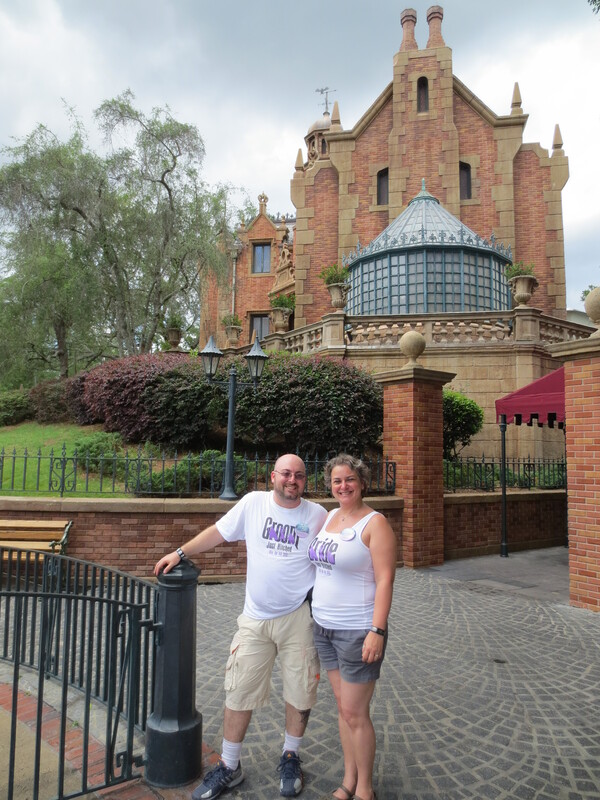 Today marks exactly a year since we left for that magical week, so I thought it would be fun to share the tales of our Disney honeymoon adventures. We chose to stay at the Caribbean Beach Resort, a hotel themed like a Spanish port town. I’m totally OK with just living here. Specifically, we chose this hotel because of the pirate-themed rooms they offer. We both tend to geek out about pirates, and while it’s not exactly what you would think of when you think honeymoon–the only option is two double beds–it’s definitely what you would think of when you think us. The pirate room includes two beds made to look like ships, with bedspreads printed with gold coins. 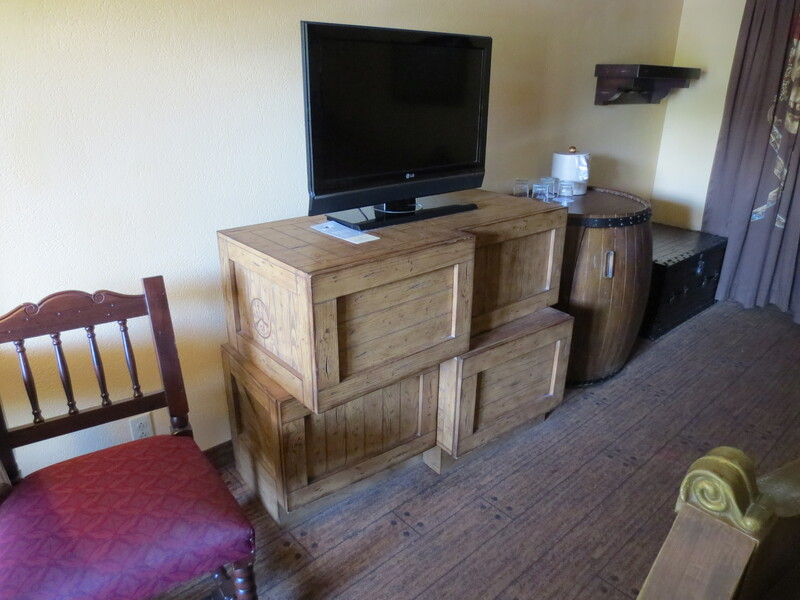 The dresser looks like a pile of crates, the fridge a barrel, and the carpet is designed to look like wooden planks. The table has a compass printed on the surface, and there’s a skull-and-crossbones curtain that separates the main room from the sink/bathroom area. Even the art on the wall is a pirate scene. We’re generally “the room is just a place to sleep, shower, and leave our stuff” sort of people, so usually we don’t make a big deal about it, but this was awesome. 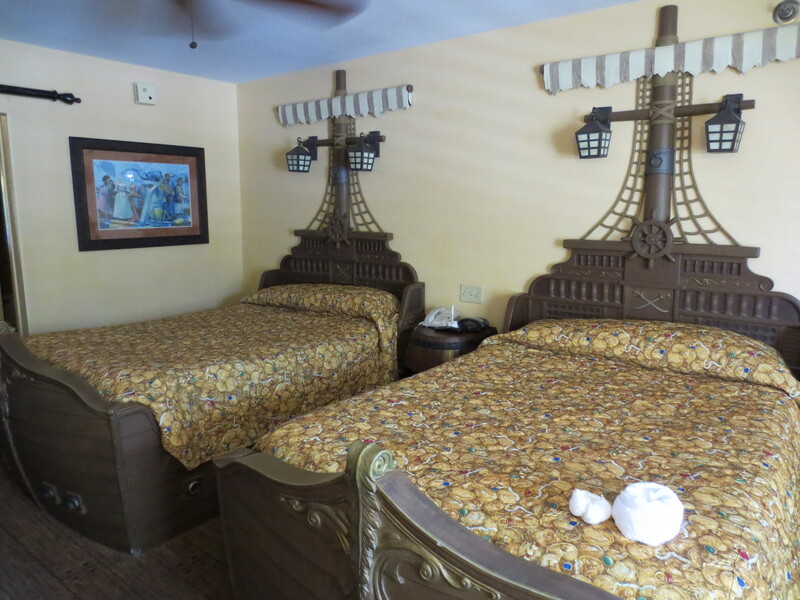 Because when you think “romantic honeymoon” you obviously think “pirate ship beds”. The dresser, fridge, and carpet are all pirate themed. I think the TV was the same model they used on pirate ships back in the day, too. We arrived on a Friday early in the afternoon, checked in (and got our “Happily Ever After” honeymoon buttons), and headed to our room. 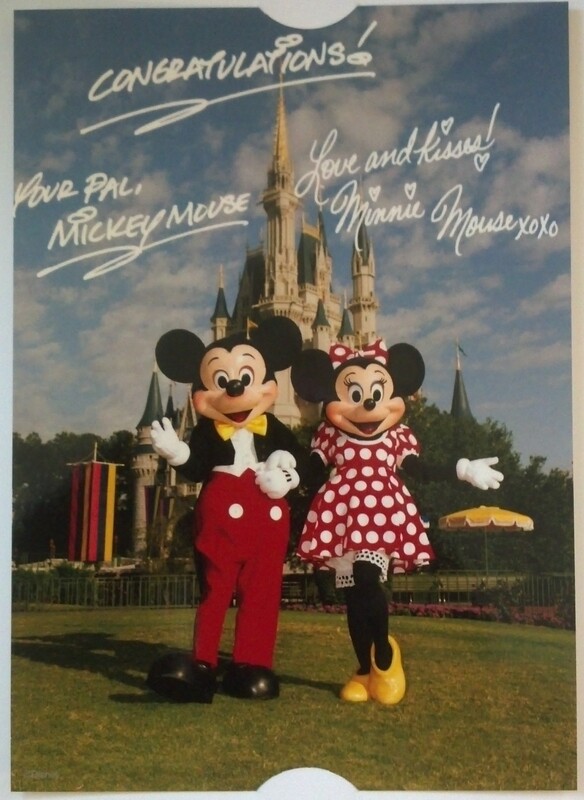 Upon entering we found a picture of Mickey and Minnie on the table, signed by them and congratulating us. There was also a voicemail from Mickey and Minnie congratulating us. Right off the bat, having only been on property for a matter of minutes, it was already magic. Our bags were being brought to our room by hotel staff as a part of Disney’s Magical Express service. We knew that we would beat them there, so we had packed our bathing suits into our carry-on luggage. We grabbed some lunch, lounged by the pool for a while, and by the time we meandered back to the room our suitcases were waiting for us. After a shower (in the pirate-ship-curtained tub with the Flying Dutchman etched into the wall) we got changed and then headed to the hotel’s restaurant, Shutters, where we had dinner reservations. We tend to grab quick meals when we’re at Disney, but we wanted a nice sit-down dinner to start things off. I’m going to briefly talk about that experience, not necessarily because of how good it was (and it was excellent) but because of the service we received. My wife keeps kosher, and we had indicated this when making the reservation. So when we were seated, the chef came out to the table to chat with her and find out exactly what that meant and what he could do to accommodate. He made menu suggestions, offered alterations to items, and really just gave us an incredible level of personal attention to insure that everything would fit our needs. It’s just a great example of the level of service that Disney is known for. 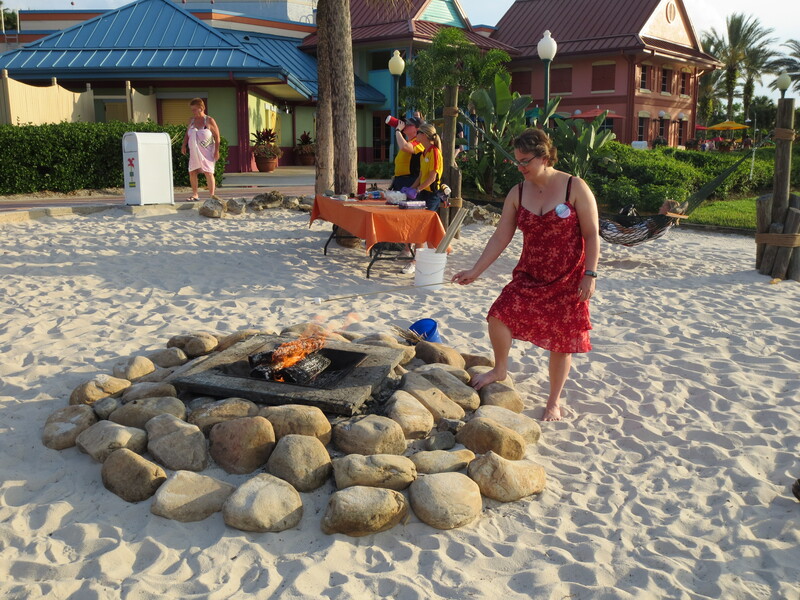 After dinner, we stopped on the nearby beach to take part in their nightly campfire marshmallow roast, then wandered back to our pirate room. The Caribbean Beach grounds are sprawling, so it’s entirely possible that we (by which I mean I) got lost on more than one occasion. We knew in advance that this was a thing that happened at the resort, so we brought our own kosher marshmallows for it. Saturday our plans were simply “enjoy the beautiful weather and take it easy”. We spent a fair amount of time at the pool, and just enjoyed a relaxing day before the fairly steady pace of parks and adventures that was going to start on Sunday. The hotel has their big pool (pictured below) as well as several smaller pools around the grounds. One of these was near our building, so if we wanted to get away from the more crowded main area we could still enjoy some poolside relaxation in a quieter environment. Really, I can’t recommend this enough to people. If you have the time, take a day to just kick back and do nothing. I don’t even want to finish writing this, I just want to pack up and go back there RIGHT NOW! We headed out to Hollywood Studios bright and early. I should say that “bright and early” meant “getting to the gate at 7:00AM” as the park opened at 8:00 and the special Star Wars pre-show “Storming The Park”–a skit featuring a pair of hapless stormtroopers–happens about a half hour before that. So we were up and out of the hotel a little after 6:00AM. It goes against my nature to set an alarm that early, though a day at Disney is probably one of the few things I don’t mind waking up early for. Plus, the wake-up calls are by Disney characters. Our first goal–involving a brisk power-walk–was to get Fastpasses for Toy Story Mania, as they tend to run out early and the ride generally has a very long line. From there our only plan was to wander the park (of course, getting back to Toy Story Mania at the specified time) and have a great time. It was a full day of rides, shows, and Star Wars characters. Lots of fun. It was also the first day we wore our Happily Ever After buttons, and cast members were frequently congratulating us in passing. Not only was that exciting for us, since we were newlyweds and not over the being constantly congratulated thing yet, but it really separated this honeymoon trip from any other. The day was capped off with the incredible Fantasmic show. We sat a bit too close, though, and it was a breezy night. So every time those beautiful water screens (fan-shaped fountains that have images projected onto them) were going, we were getting soaked with the ambient spray. On the upside, we were close enough to get a really good view of the characters on the boats, though we were constantly wiping the water off of our glasses to actually see them. The next morning, we headed to the Polynesian Resort, where we had booked a character breakfast at the ‘Ohana restaurant. Gilly had never done one, and I hadn’t done a character breakfast since my daughter was small. The food was great (they serve a pineapple/orange/guava juice that’s simply amazing), we got to see Lilo and Stitch as well as Mickey Mouse and Pluto, and the server noticed our Happily Ever After buttons and brought out a cupcake for us. 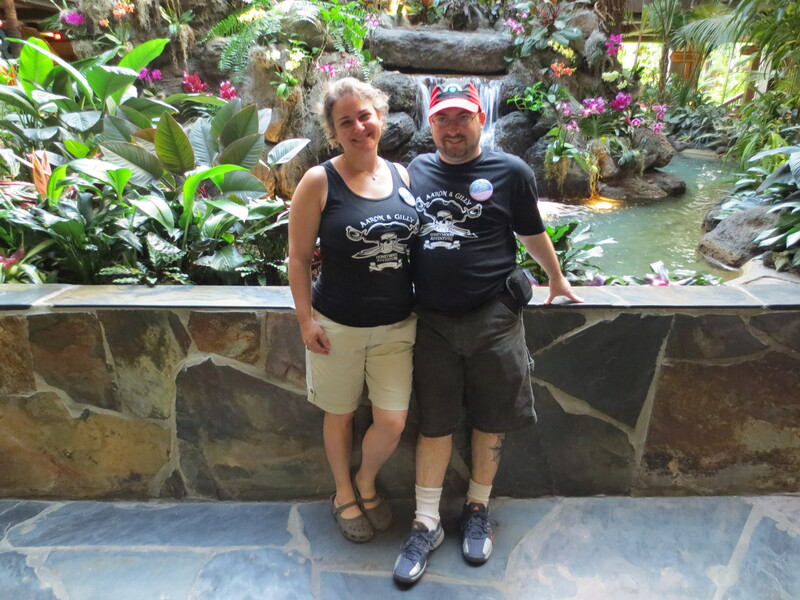 I love the Polynesian, so just being there and soaking up the ambience of the resort is a treat for me, and doing so surrounded by Disney characters while eating tasty food with my wife was extra cool. We also had our pictures taken in front of the big fountain in the lobby, which several months later they announced was being removed (it’s been there for as long as I can remember), so I’m glad that happened. I’m going to miss that fountain. Maybe I can just ask the Disney work crew to relocate it to my living room. From the Polynesian we headed towards the Fort Wilderness Lodge, where we had reserved a horseback trail ride for that afternoon. 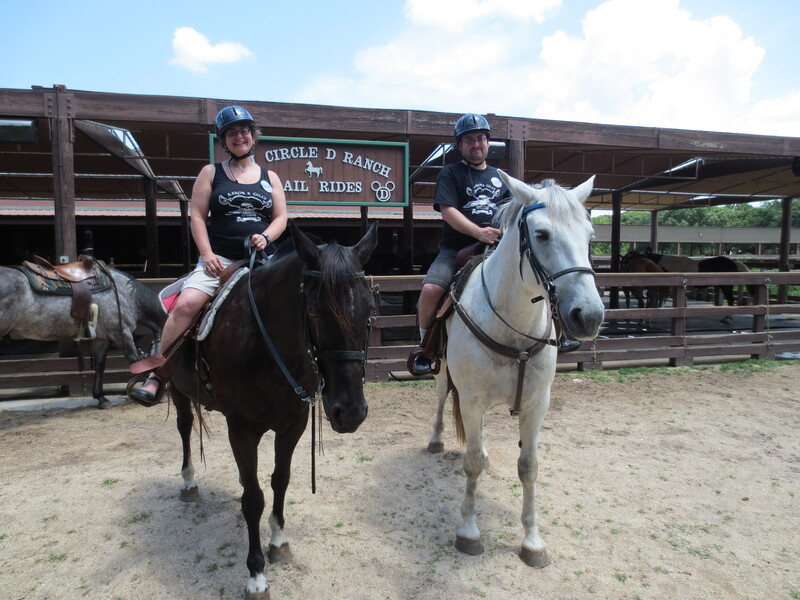 We got settled onto our horses, got the safety instructions and rules, and then set out. It was just the two of us, along with a pair of Disney cast members riding in the front and rear, walking along a beautiful wooded nature trail. It was secluded and peaceful, and a nice change from the bustle and excitement of the parks. Gilly rode Oliver, a black horse who was generally well behaved. I was on Dash, a former parade horse (he played Maximus from Tangled) who was a bit of a mischief maker. While we were listening to the safety speech he managed to use a fencepost to remove his own bridle, and during the walk he kept trying to veer off and eat the foliage. He never argued when I urged him back in line, but he kept trying to see how much he could get away with. The nature walk lasted about forty-five minutes. and after that we headed back to the Caribbean Beach for a nap (and also, to soak our sore post-horseback-ride butts in the hot tub for a bit). After some relaxation and some dinner, we headed back out. This time our destination was the Contemporary Resort for our next reservation, the Pirates and Pals Fireworks Cruise. It had actually been a bit thunderstorm-y while we were at the hotel, so there was some fear that the cruise might be canceled, but by the time we got to the Contemporary the skies had cleared up and it was in fact a beautiful night. I wrote up a full description of the experience here, and it was a highlight of the trip. Tuesday- Typhoon Lagoon, Now With Real Typhoon! Tuesday started out at a more casual pace, as we worked our way towards Fantasia Gardens miniature golf. As we weren’t entirely sure where it was (turns out it’s across the street from the Dolphin hotel) we ended up on a bus and then a boat, but eventually we got there. Somehow we ended up at Hollywood Studios while in transit. I’m not sure how that happened. 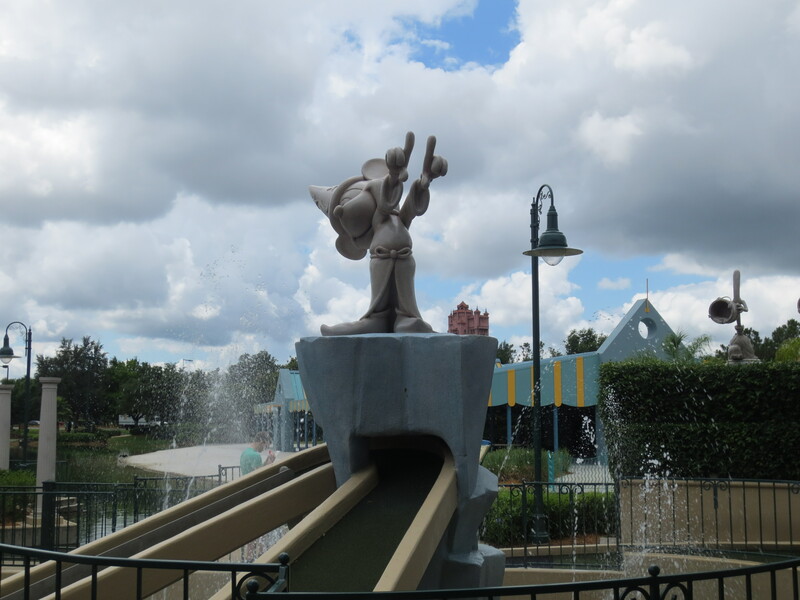 Fantasia Gardens is a miniature golf course themed after the movie Fantasia, and has music as well as some basic special effects. It’s a little cheesy, but it was a fun and slower-paced way to spend the morning. The second to last hole at Fantasia Gardens is extremely difficult. However, when you do finally sink the ball fountains spray and music plays. So that’s neat. We then went to Typhoon Lagoon, one of Disney World’s water parks. 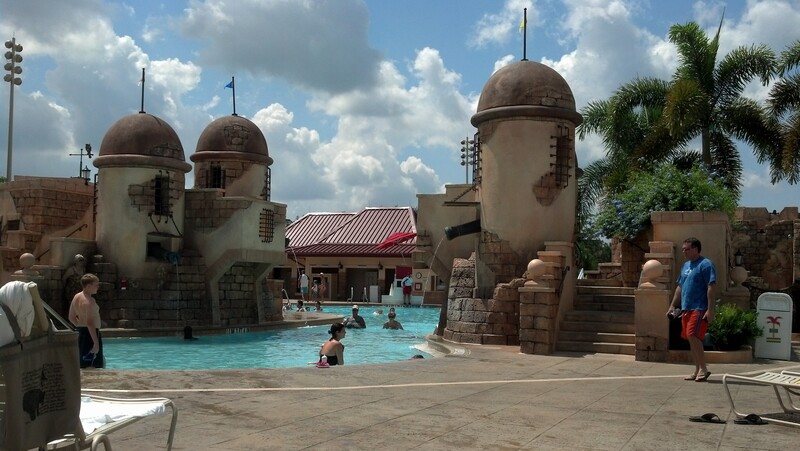 I’ve actually never been to the water parks during any of my visits (and Gilly, who had only been to Walt Disney World a couple times prior, hadn’t been there either). We spent some time in the massive wave pool–where every now and again a six-foot swell rolls through–and we went to the snorkeling pool where you’re given the opportunity see sharks and rays. With my glasses off I can’t see anything (wearing the mask meant I couldn’t see any of the animals) so I bowed out, and she said afterward that it was underwhelming. The pool is so deep, with the sharks and rays so far down, that there wasn’t a whole lot to see anyway. Unfortunately, we didn’t get to do much more, as the weather quickly turned from overcast (it had been drizzling on and off throughout the morning) to full-fledged thunderstorm. We grabbed some lunch while hoping to wait it out, but ultimately opted to cut our losses and left. The park does have policies concerning inclement weather, though: we were there for less than four hours, and the park was closed for more than a half hour, so we got free tickets to return. Our next stop was Downtown Disney, where we met up with my grandmother and her entourage (the two guys she lives with, which I suppose sounds really weird without proper context) and had dinner at Wolfgang Puck Express. We got ice cream at Ghirardelli (because ice cream), wandered around the shops for a bit, and eventually all went back to the hotel. 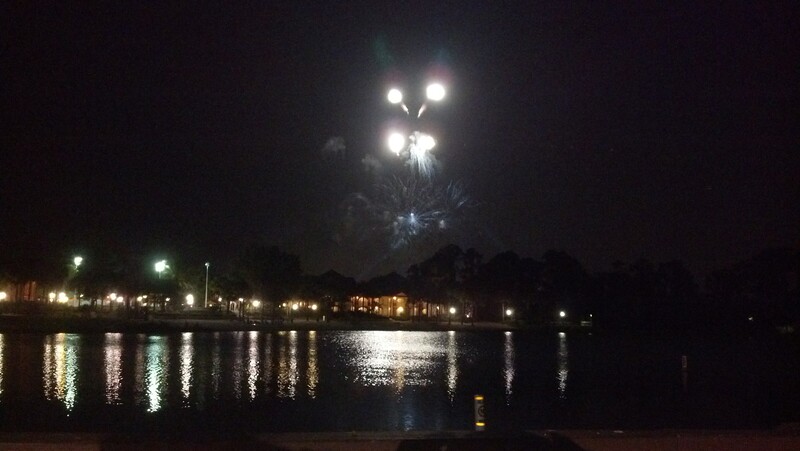 From behind the main building of the Caribbean Beach you can see some of EPCOT’s fireworks in the distance, so that was a nice way to end the day. There are worse ways to end your day. We knew, as soon as we started planning our Walt Disney World honeymoon, that we wanted to cap it all off with Magic Kingdom. It’s so magical, and so much fun, that we both feel that it’s a great way to end a Disney trip. We were not wrong. *) The first time we went by Haunted Mansion, it was temporarily closed (due to unruly spirits, of course). However, this meant that the courtyard was completely empty. This is rare, as obviously there are guests coming and going, so we asked a cast member if we could get our picture taken there. *) Buzz Lightyear, at his meet & greet location in Tomorrowland, saw the buttons and wanted to see Gilly’s ring. He gave me a thumbs up. Buzz Lightyear is cool. Look! 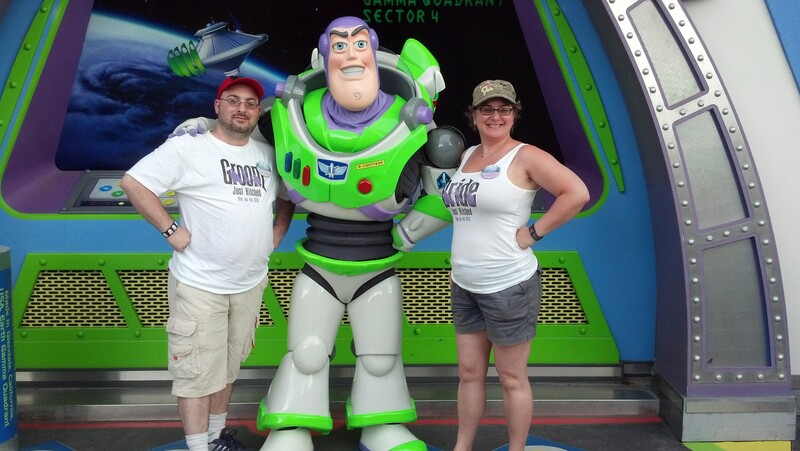 It’s the REAL BUZZ LIGHTYEAR! *) Throughout the entire trip, cast members (and many random guests) saw the Happily Ever Buttons and congratulated us. In Frontierland, though, one cast member took it further. We were perusing a shop when she saw us, and she dragged us over to a nearby phone behind a counter. She dialed a number, then handed the phone to Gilly. 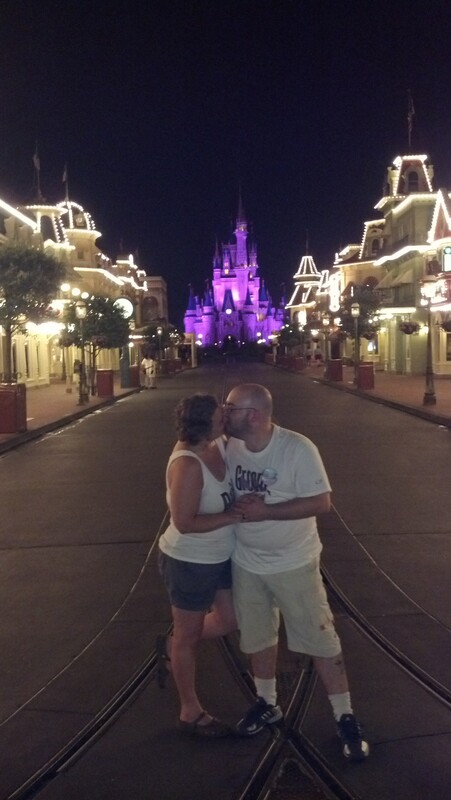 Mickey and Minne were on the other end, gushing about how exciting our marriage/honeymoon was. They asked for the phone to be passed to me, and then the happy mice congratulated me as well. 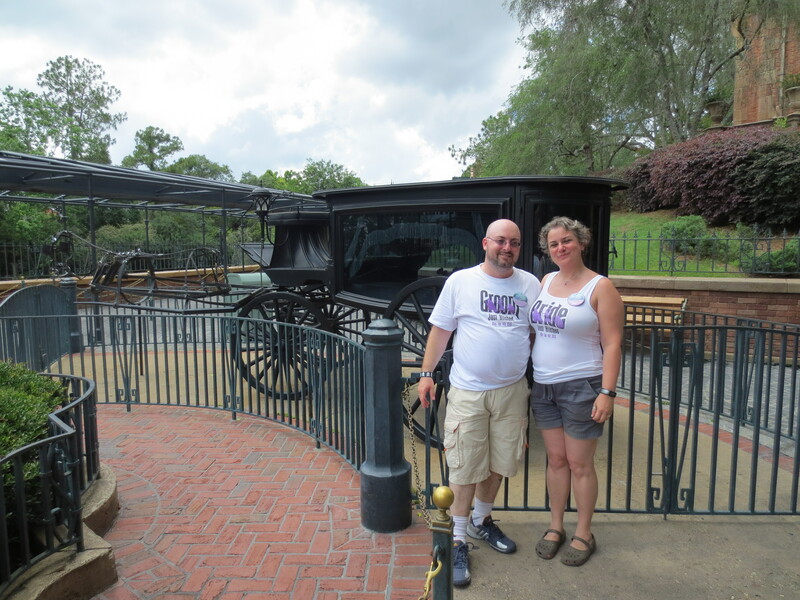 While Gilly was on the phone, the cast member asked me our names and where we were from, and when the call was completed she took us out into the middle of the Frontierland street to announce to everybody that we were there celebrating our honeymoon. There was applause and cheering. It was cool. *) We hadn’t really planned to see the Main Street Electrical Parade, as we had seen it on our last trip. Not that we don’t love it (I really, really do) but when everybody is on the parade route it’s often a good time to see some of the busier attractions. However, in passing we ended up accidentally getting a great vantage point, so we stopped to watch the pretty lights. 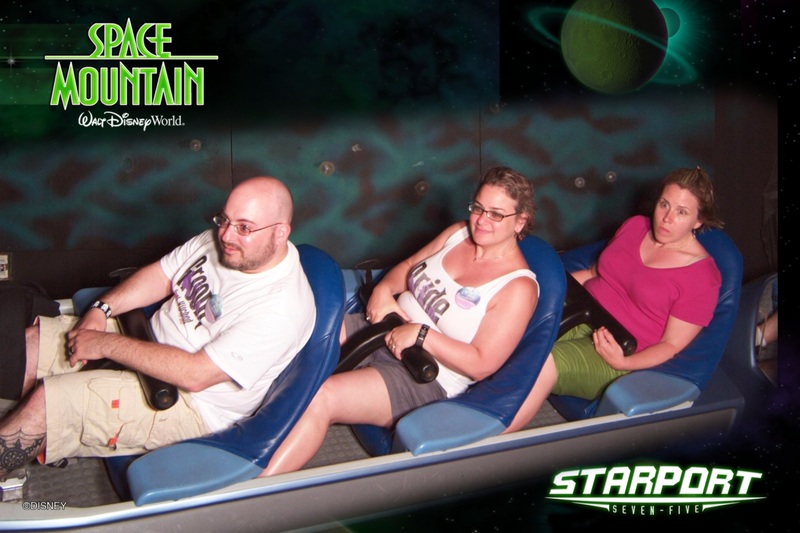 *) One of the last things we did was Space Mountain. Gilly isn’t big on roller coasters, but she felt that she had to do this one because it’s such an iconic part of Walt Disney World. So, after lots of psyching herself up, we finally got in line. She was scared, but felt that with me next to her it’d be fine–it wasn’t until we were almost to the front when I remembered and mentioned that the cars are single-file seating (oops). She rode it, though, and while she’s glad she experienced it she’s not eager to go on it again. *) While we waited for the Kiss Goodnight, every other guest left the park. There was one family hanging around for a bit, but eventually they left as well. So it was just the two of us and some cast members on the otherwise empty Main Street USA. There was something extra special about that, like the Kiss Goodnight was happening just for us. Look past the “d’awww, they’re being so sickeningly CUTE” for a moment and notice that there’s nobody else on Main Street. Pretty magical. Sadly, the day did have to end–though by that time it was technically the next day anyway–and back to the Caribbean Beach we went for one last sleep in our pirate ship bed. You can fit a lot of fun into a few short hours. Our return flight wasn’t until the evening, so we didn’t have to leave for the airport until the afternoon, and we wanted to get the most out of our remaining time in the Most Magical Place On Earth. We checked out and left our bags at the hotel, deciding to give Typhoon Lagoon another go. It was a beautiful day, and we were able to do a lot more than when we were there earlier in the week. After a couple hours of water slides, and some time in the lazy river, we hopped over to Downtown Disney for lunch and one last jaunt through some of the shops. We ate at Wolfgang Puck Express again–really, if you find yourself in Downtown Disney, check them out. We usually get their pizza, which is excellent, but this time Gilly ordered the spaghetti. The sauce was light and garlicky, full of fresh flavor, and just out of this world. By this time, we were out of time, so we hurried back to the hotel and boarded the next bus to the airport. Really, this was the worst part about the honeymoon–the fact that we had to leave. Our honeymoon was everything that we had wanted it to be, full of fun as well as special moments that made it much more than “just another trip” to Walt Disney World. Here’s the thing, though: we got married in a private legal thing, then had a bigger ceremony the next day for family and friends. Then we had another reception thing the following week for more friends. So… three weddings means three honeymoons, right? We get to go back and do this again twice more… right?